We watched the Grand Parade today. Very impressive! I'll post some pictures when I get home. Some of the cast swooped and whirled as if they were on a motorised platform, and I'm guessing that they were indeed. So I thought about how I'd design such a thing. A circular base, with four six-inch wheels driven independently by electric motors, controlled with a microprocessor. But that leaves the question of how do the witches control the motion? My first thought was, someone else remote controls them. But that's not going to work with sudden changes of direction; the witch will fall off if she isn't expecting it. I can see both her hands, so she can't be using hand controls. Then I thought foot controls, but that won't work when she's making sharp turns. So I don't know. Then I thought, she's waving a magic wand. There could be a couple of buttons in the base that control the motion via wires that run inside her sleeve. There's no dogs in Eurodisney. At least, I didn't see any. But by golly it's crowded. The queues for everything are long. At least, they are for everything that's free. The things that you have to pay for (and there are plenty of opportunities to spend money) are very short. There's a lesson for the NHS there. Last night, we slept at the Renaissance Hotel, St Pancras. Or rather, we didn't. The air conditioning was too noisy to permit sleep, and the hotel staff said that it couldn't be turned off. Then in the morning, ladysolly's porridge was A) too cold and B) they put sugar in it, when she asked for brown sugar on the side. 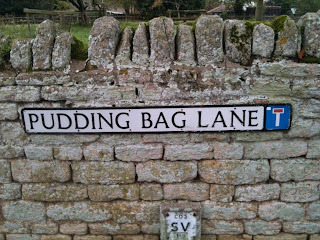 She sent it back, and it was replaced by hot porridge, brown sugar on the side, but C) it was too lumpy to be edible. And this is supposed to be a five star hotel? We won't be going there again! Next time we catch the Eurostar, I'll look into picking it up at Ebbsfleet. Parking is £9 per day. Then we went to St Pancras to catch the Eurostar. That was great, except that at Ashford, just before going into the Channel Tunnel, the person responsible for safe tunnel traversal had some dreadful accident and had to be taken to hospital. The announcement said "You remember Apollo 13? Well, ..." and I had mental pictures of an exploding oxygen tank and the need to use the lifeboats that all trains carry. We had to wait nearly an hour for a replacement safety person before we could proceed. That made the journey an hour longer, which doesn't sound like much, but in a trainfull of 2-10 year olds heading for Eurodisney and getting bored, it was dire. So we arrived at the terminus, and the hotel was a short walk from there. We had a look around the Village, but the main day will be tomorrow. However, I can recommend the "Inventions" eating place; great food, and all you can eat. And, as you can see, their Wifi works well, and is free. Today to Knotting, to do a circuit of 70 caches, with SimplyPaul. But first, we went to somewhere completely different, about an hour from there. This was because some fool put in E instead of W on the satnav. I apologised, and Paul was very gracious about it. But it meant that we didn't get started until 12 noon, about 90 minutes later than we should have. I packed a rucksack with two bottles of water, spare GPS, head torch, spare head torch, sandwich, mittens; Paul put a few items of food and drink in his pockets. In his long black coat, he looked very Hasidic. We set off. First we tried to find the bonus of another series, that I had calculated was probably on the route. We couldn't find it, so after 20 minutes we gave up, and buckled down to the series "Seven's 70th birthday." There's not much to say. The cache pages say that it's 12 miles, which is just on the limit of what I can handle. At 2 mph, that would take 6 hours; it took us 8 hours - I'm not a fast walker. Most of the caches were easy, which is necessary on a long circuit like this. But there was one on a big tractor tire, where I had my hand (and was looking) within a quarter of an inch of the cache, yet still failed to see it. Fortunately, Paul found it. It got dark at about 4:30; we had 25 caches still to do. We both had head torches, but Paul's batteries were running out. Also, my energy was running out - we hadn't found a good place to sit for lunch, so I didn't get my lunch until 8pm. The last few caches were gruelling. My back hurt, my thighs hurt and my feet were starting to hurt. The ground was soft, cloggy mud that built up on the boots, and it was uneven. But eventually we got to the road, and after that it was plain sailing. We did 72 caches today; not bad for a day on foot! I'm surprised! Astonished!! Gobsmacked!!! I'm a programmer, not a hardware engineer. I built a crystal radio that worked when I was 14, but I haven't advanced much since then. I can use a soldering iron, but I'm not proficient. Yesterday, the AirPi arrived. Today, I built it. It comes as a kit of parts, plus a PCB, and you have to solder the parts into the PCB. There's lots of scope for getting it wrong; chips to solder in the wrong way round. I did manage to solder one component into the wrong place, and unsoldering it was the dickens, but eventually I had something that was as close as I was ever going to get. So I connected it up to Xively, and you can see it here. What you're seeing there, is the conditions in my garage, where it's currently running. It'll stay there for a while - tomorrow I'm going out on a 12 mile trek, and the day after I'll be waddling like a penguin. But when I come back from Eurodisney, I'll A) install it outside, and B) make the display a lot easier to understand. For example, the pressure is currently in pascals, but this is usually given in millibars (1 millibar = 100 pascals). And UV Level needs some explaining. A chargeback happens when a billing on a card is disputed. So, if you buy something and pay by card, and then subsequently you tell your card company to claw the payment back, that's a chargeback. Usually, credit card companies don't ask for proof that the chargeback is justified. They don't even ask for evidence. They just do it. The new rule is that, as well as costing the vendor the amount that has been clawed back, Barclaycard also impose a fine of £10 (they call it a "processing fee"). Even though it's so easy to do, you shouldn't do a chargeback lightly. If your credit card number becomes known as one that does chargebacks, then merchants are within their rights to refuse to accept payment from you via credit card. Which could be a nuisance - you really don't want to get onto any credit card Blacklist. I've never done a chargeback. I usually buy things via Amazon or Ebay, using Paypal. Amazon are, I think, quite reputable and I believe that they'll respond appropriately if I ever need to complain to them. The small, far-off companies that I buy from via Ebay - well, there's Ebay's dispute system, which I've used a couple of times (usually when the wrong thing is sent, or if something is totally unsuitable for the purpose it was sold for) and that's always worked for me. The vendors on Ebay don't want to get a poor review. If that were to fail, Paypal would spring into action to deal with the problem, and get me a refund. HobbyKing, when they sent the wrong stuff to me, sorted it out ... eventually. So I've never needed to do a chargeback. But this £10 fine on card chargebacks is going to have a bit of a chilling effect on the ability to buy small items over the internet. Look at it from the vendor's point of view. He's selling an Acme Widget for £0.99, and people pay by various means, mostly Paypal and credit cards. If the buyer stiffs him by subsequently doing a chargeback on the transaction, under the old rules, the vendor lost £0.99. Under the new rules, the vendor loses £10.99. Credit cards suddenly got a bit less useful. I just got a letter from the DWP. They're giving me £10 as a Christmas Bonus. I'm not going to tell them that I'm not actually Christian. Hurrah! My big Hobbyking order for batteries has finally shipped. I ordered a bit over a month ago, they sent the wrong stuff, I sent it back, they were then out of stock on batteries, but today they emailed me to tell me that they've shipped. This comes at a good time. Battery 6, yesterday, only gave me 4 Ah, and it weighs 7.5 pounds. One pair of HK batteries, which should give me 5Ah, weighs 2.5 pounds. When this order arrives, I'll have five such pairs, giving me a range of 75km for 12.5 pounds weight. Also, my AirPi has arrived. Now I need to solder the components to the PCB, and hope that it works. Grandson.1 has a cold. This would normally be of small significance, but we're going to Eurodisney at the end of this week. Ladysolly has made contingency plans - if no baby, then no trip. I think she's daft, a small thing that that isn't going to stop daughter.1 and grandson.1 from visiting Eurodisney. Ladysolly's out playing bridge all day, so I get to go out all day. First, I did two more of the "Treasure of the Templars" series. Not many people are doing these, but I like them. I did another one later, so now I've only got one to do, and then the bonus. Next, I went to Rushden. I parked, and got the bike out, picking up 20-odd caches in the area. One of them was really difficult, but I was lucky that the cache owner rogue5 came out of his house to encourage me ... and give me hints. Eventually I found it, and it was very nicely done. Then I persuaded him to invite me in for a cup of coffee. He also gave me directions so that I could get to the track on the edge of town, where I did several more, including two very clever caches; one disguised as a tap, and the other in a fake drainpipe. I also bumped into another cacher there, in the act of setting a new cache, so I got an instant First To Find! I got back to the car at 3:30, for lunch. 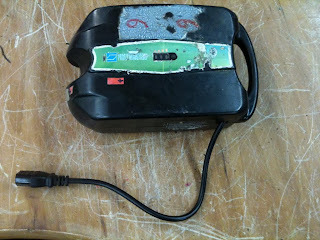 I'd been running on battery 6, but it only gave me four amp-hours before it died (it's supposed to be ten, some hope! ); fortunately, I had one of the Hobbyking batteries with me. 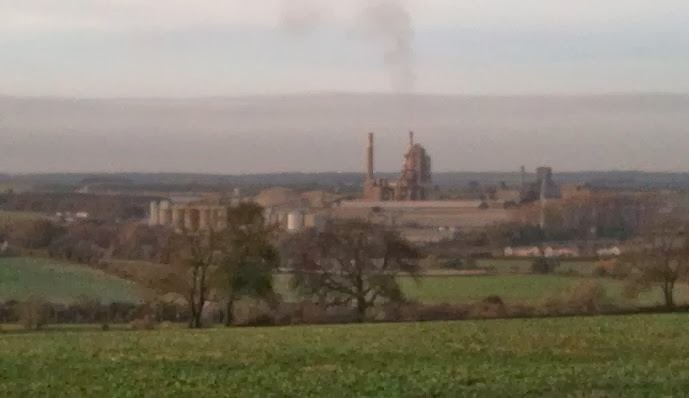 When lunch was done, it was starting to get twilighty, so I decided not to do a tour of the northern half of Rushden; instead I did another of the "Treasure of the Templars" series. That took me to a church, where a multi started. I collected the info for Louisa Smith, and the others I needed, but when I got back to the car, the numbers wouldn't make sense. Eventually, I discovered that there are two Louisa Smiths in that churchyard. Using the info for the right Louisa Smith took me to a likely-looking place, and there I quickly found the cache. Then on to the best part of the day; there are five night caches in Irchester Country Park, and I wanted to do all of them. I did the first one, it was fairly easy. The second one escaped me, I couldn't even get started. Other cachers have had the same problem, I suspect that the first marker is missing. Then I did the other three, which were pretty hard work, because they led me across the "nap of the land", I was struggling uphill then skidding downhill as I went across the waves in the terrain, and as it was all forest and undergrowth it was tough. But I did manage to find all three of them. And I also did a cache that was high up in a tree, and I did it without climbing, using my stick to dislodge the cache, and also to replace it. So, 30 caches done today, and a really good day out! The day started off badly - an electric razor that I ordered two months ago, arrived. That was bad news because I'd given up on it and ordered another one, which is on its way to me now. Oh well, they are good razors (I know because I'm already using one, this was going to be a spare). Then ladysolly and I prepared to go out. Only we didn't; the car wouldn't start. I diagnosed it as dead battery, and I might know what drained it, but I'm not sure. So I put the battery on charge, and we decided to take our spare car, an 10 year old Volvo that still runs fine, but would probably sell for tuppence ha'penny if we retired it. That meant transferring a bunch of geocaching kit from the Freelander to the Volvo, which didn't take long, but led to another problem later, as you'll see. We stopped off at London Colney services; it was very full. Absolutely heaving. Ladysolly says it's because it's Christmas, but surely Christmas is a month away? And London Colney isn't exactly a major shopping center. I dropped ladysolly outside M&S so she could buy the sandwiches, and I visited the petrol place to fill up. That took me longer than usual (see heaving remark above). Then I went back to park outside Starbucks, to pick up ladysolly when he came out with our coffees. That all took me quite a while; parking took a long time (see heaving remark above), but eventually I was nicely ensconced not far from Starbucks, and I sat and waited for her - sometimes she takes a long time getting these supplies. Not this time, though. She went through M&S like greased lighting, and was in and out of Starbucks in a trice. And then ... well, we're not sure exactly what happened, but she couldn't find the car. Our best guess is that this was because when she looked in the usual place (just outside Starbucks) I wasn't there yet (delays caused by heaving, see above). So she walked round again, and again she didn't see me. So she phoned me. I didn't answer the phone. So she phoned me again. Again I didn't answer, she was put straight through to my voicemail. She phone me five times, to no avail, but which time she was getting really angry with me. Then she texted me, I got the text, drove the ten yards to the front of Starbucks, and picked her up, by which time she was incandescent with rage. I immediately got a major earful. I was roundly castigated for having switched my phone off; I pointed out that it wasn't off, I actually don't know how to switch it off, and anyway I got her text, so it couldn't have been off. She tried phoning me as we drove round the M25, and got the same problem. After we parked, I established that I could phone her, but she couldn't phone me. When we got home that evening, I called Vodafone for tech support. They immediately diagnosed the problem, the phone was on "unconditional divert". I'm sure I didn't make that happen, and the sequence that you have to key in is so long and complex, it couldn't have happened by accident. I suspect Vodafone did it, but, oh well, I keyed in ##002# and pressed send, and everything works now. And while I was talking to them, I ordered the micro sim card that I'll need when I inherit ladysolly's phone. They wanted to charge me £2.50 for this, but I pointed out that I'm a "Valuable Customer", so they waived it. Useful phrase, that. Starbucks put the coffee into china mugs, and when ladysolly repeated that this was for take-out, they transferred it into paper cups. But that lost some of the heat. The delay in ladysolly getting to the car made it cool down some more, and you can't stop for coffee on the M25. So by the time we could pull in, it was lukewarm, and that's being generous. We found a place to park and have lunch, then went to the parking place for the circuit we planned to do, "Toot Hill Trivial Pursuit". We got our kit on, and I started up the GPS ... GPS? Where's the GPS? A substantial hunt revealed the fact that I didn't have the GPS. I had the PDA with mapping and Memory Map, but that's useless without the GPS that it connects to via bluetooth. If I'd been in the Freelander, that wouldn't have been a problem; I have a spare GPS (and a spare PDA) in the back. But we were in the Volvo. My iPhone 3GS has always been useless for geocaching, because it takes a couple of minutes to respond to any movement. So I'm 20 yards past the cache and it's still saying it's 40 yards in front of me. Fortunately, Ladysolly has a 4S, and that works for caching, so we decided to use that. And I took my PDA anyway, because although I didn't have GPS function, I could still use it to read the cache pages, because I preload them on the CF card. We found the first few caches, and then I took us 50 yards down the wrong track, which is usually no big deal, but on the way back to the right direction, ladysolly got a boot stuck in the mud and fell over. No injuries except to her dignity, but she did get very muddy. And then something wonderful happened. I tried using my iPhone 3GS, and, as if by magic, it's now sufficiently responsive to be useful for caching! Instead of updating its position after a lag of a couple of minutes, it does it every couple of seconds. I updated the version of Memory Map only today; maybe that's what did it? Who knows. The problem with iPhones is that they make a major effort to hide any useful information from you. Not that this helps much. Ladysolly decided that she wants an iPhone 5 for Christmas, so I'll be inheriting her old 4S in a few weeks anyway. Then we couldn't find number six in the series, which everyone else could find. Then we couldn't find number 7, but several people recently couldn't find it, so it's probably gone. So I made a guess about our missing values, "pig" and "chicken" on the assumption that each one was different, only I made a blunder and took us to the wrong place. Ladysolly pointed out the blunder, I recalculated, and that, hilariously, took us back to where we'd parked in the first place. Well, ladysolly thought it was funny. So then we hunted around for this bonus, until a man nearby who was mending his fence said "Can I help you?" (meaning "what are you doing, acting so suspiciously?" but people tre too polite to put it that way) which normally gets a "No thank you, I'm fine" from me, but this time, I said "Yes, actually, that's very kind of you," and I explained that I was looking for a geocache, and his help in searching for it would be very gratefully received. But he didn't help, he went back to his fence. And at that point, we decided to give up, have our afternoon coffee from our flask, and drive home before it got dark. Thus avoiding any further disasters. Except, I broke a fingernail, but fortunately I can regenerate. Six caches found, three DNFs. And I found the missing GPS, it had fallen next to the handbrake in the Freelander. After yesterday's tough day out, today was mostly resting, but I did a bit of maintenance on bike.2 and fixed the computer I use for testing hard drives; the memory was the problem, an old 184-pin SDRAM. The computer itself is more than a decade old. We watched the Dr Who 50th anniversary program, and I played the Google Doodle Dr Who game. Tomorrow I'm taking ladysolly caching, to Toot Hill and Chipping Ongar. And on Friday we get to go through the Channel Tunnel on the way to Eurodisney! I have to say, I'm looking forward to the train journey more than to the theme park. This started well. I went out to do "Another King's and back". I loaded up the bike with battery 6 and one Hobbyking battery, and set off. The second cache wasn't there. It had a very specific hint, so I replaced it. Then I couldn't find number 16. But the big catastrophe happened as I went from 23 to 24. The map showed a bridleway, the signs said a bridleway, but on the ground was just a field of loose earth. That's the worst kind, because it clogs up the bike so badly that I can't even push it. So after 200 meters, I got to cache 24, but then my knee was hurting as of a sprain, although I don't remember spraining it. And I had another 100 meters of loose earth to cross, one painful step at a time. Eventually, I reached the safe haven of the grass at the edge of the field. And by that time, the bike was so totally clogged up that the rear brakes couldn;t work. After that, things weren't too bad, but I got back to the car a lot later than I'd planned, my knee hurt, my back hurt from the carrying, and I was exhausted. So after lunch, I went home. Only 29 caches done today. On the plus side, I found 3p in the road by the car when I got back. I've been huddling indoors to avoid the wet and cold, but that can't go on - tomorrow, I'm venturing out to Stamford, there's two circuits there calling me. My batteries are now all fully kettle-plugged, which will be nice. And I have a pair of army surplus mittens, size extremely large, so that I can wear my biking gloves inside them. That way, when I take them off to sign a log, only my fingers will be exposed, and when I put them back on, my hands will be warmer than with just the fingerless biking gloves. I don't know whether this is going to be practical - only one way to find out! Looking at my email today, I found about a hundred zip files. All of them were spam, and I'm guessing that all of them were malicious software - trojans. My guess is that the trojans were sent as zip files because for some systems, if you click on the attachment, then the computer unzips it, finds an executable inside, and runs it. I don't know which trojans are being sent - I'd guess they are a few different ones because the file sizes are different. But what impressed me today, was the volume. 100 trojans sent to me per day! The zombie apocalypse is here. My email system sorts my email; emails with attachements that are zip files (or similar) go into their own area. And then when I look there, I delete them. I use keyboards a lot. And I can type fast enough; for as long as I can remember, I can type as fast as I can think what I want to say. But I do like a good keyboard. What makes a good keyboard? Different people will have different preferences, but I can talk about what I like. First of all, it's important to me that a keyboard be very tactile. I want a keyboard to make a distinct "click" when I hit a key. I don't like mushy keyboards, the "chiclet" (such as was seen in the old Sinclar Spectrum) I like even less, the old ZX81 keyboard was the worst I've ever used until I inherited ladysolly's iPad, and then I discovered one that was even worse. It's to small, there's no tactile feedback, and not even any sounds. I hate typing on that thing. The iPhone keyboard is, of course, even worse. All the horribleness of the iPad, plus it's much, much, much too small. The only excuse is that you can't have a full sized keyboard on a phone - or at least, not today you can't. The best keyboard ever made is this one. Notice the IBM logo in the top right hand corner? 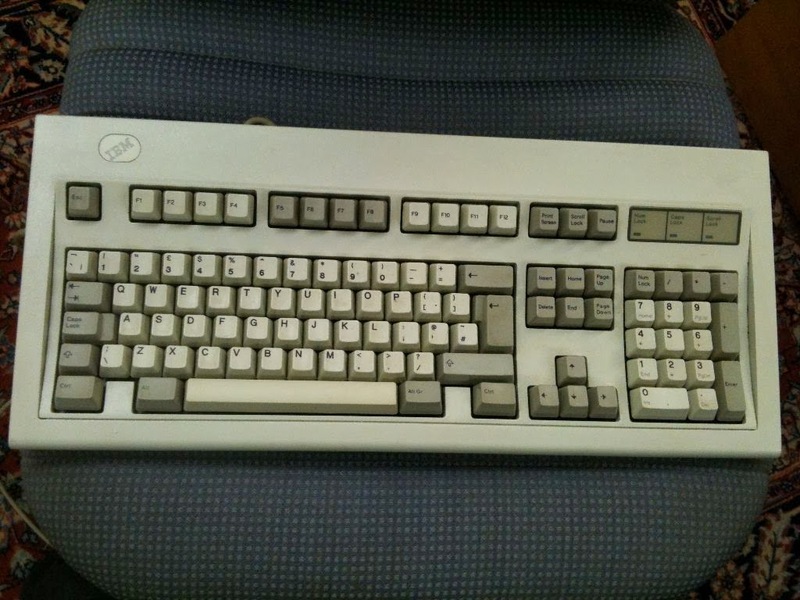 Yes, it's the old IBM AT keyboard, also known as the Model M. It uses a buckling spring to work its magic. I can really feel when I've hit a key. A couple of decades ago, I realised that they might not be available for ever. So I bought several. They were pretty old when I bought them; vintage 1986. Now they're 27 years old. And they all still work fine. One of them is connected to a Raspberry Pi that I use for a terminal server; I had to get a keyboard-USB interface to make that work. Another is on the workstation that I use for general purposes, and I'm typing this blog on it. 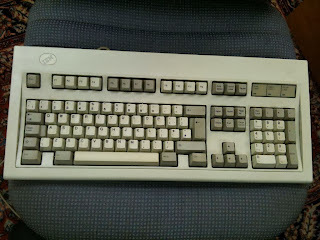 You can still get this type of keyboard from Unicomp. You're looking at $79, plus $59 for shipping. Or you might be able to find a bargain on Ebay. No, you can't have one of mine. Today it rained, snowed and froze; I stayed at home. I did some work in the computers, and then I modified two of my bike batteries. I'm no longer using the battery holder that comes with these; the problem is they just aren't strong enough to take the weight of the battery on rough ground. The jouncing around slowly wrecks the holder. But who needs it anyway? Getting the battery in and out of it was always a big deal, because it was very tight, and needed to be levered on and off. What I'm doing now, is putting the battery in a rear pannier. It doesn't cause a problem there, my center of gravity is a bit lower, and it's easy to remove when I need to lift the bike over an obstacle. The male prongs slide into the slits at the bottom. There's two problems; 1) it's easy to put it in the wrong way round. I discovered empirically that this doesn't make anything blow up, but it can't be good. 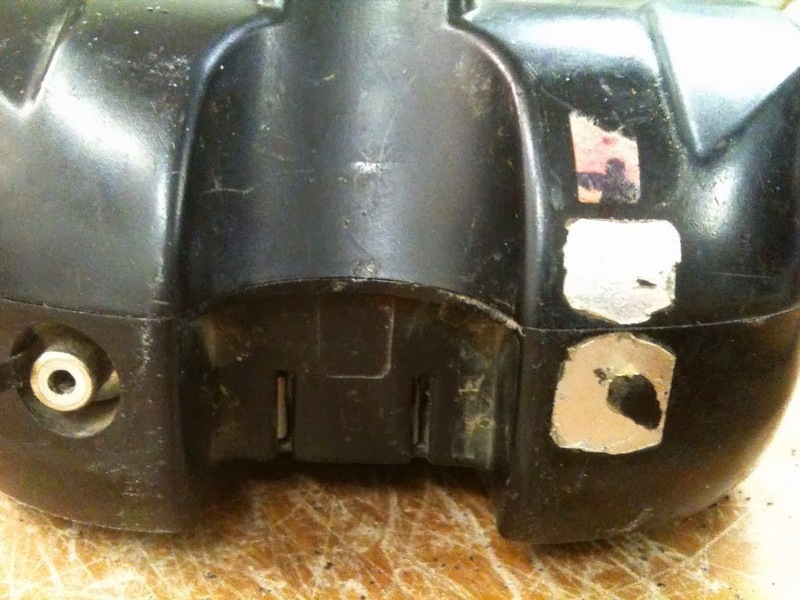 The second problem is that while I'm riding along, the prongs work loose from the battery and I lose power. I have to stop, get off, and delve about in the pannier to reconnect. And my wattmeter loses track of how many amp-hours have been used. I opened up each battery, and soldered the leads of the kettle plug to the power connector inside, and the wire comes out of the battery via a small hole in the shell. This reduces the waterproofness of the battery, but it never was very waterproof, and now that it's sitting cosily in a pannier, that won't matter. Two advantages. 1) It's impossible to plug it in the wrong way round, so I no longer have to think about that. 2) The male plug stays firmly in the female socket even when riding over the roughest ground. And because I've chosen to have the female at the battery side, it would be really difficult to cause a short circuit. Which would be annoying, even though there's a fuse in the battery to stop it from becoming catastrophic. I've now done this to all three of my old batteries, as well as to the Hobbyking batteries. 15 stone 3 pounds, and outside there's heavy rain and sleet, I'm glad I didn't go out today! Update ... it's now heavy snow. 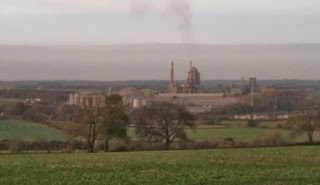 North to Barnack today, for a long day on the bike. I parked, loaded up one old battery (number 7) and a couple of the Hobbykings, and set off. I did about 20 kilometers in the morning run (I use the term "morning as meaning, pre-lunch) fo 40-odd caches, no DNF. I had a quick lunch back at the car, changed the battery to number 6, and set off again, for another 35-odd caches. No DNFs, although a couple of caches were nearly DNF. I didn't need to use the Hobbyking batteries, the old ones were enough. 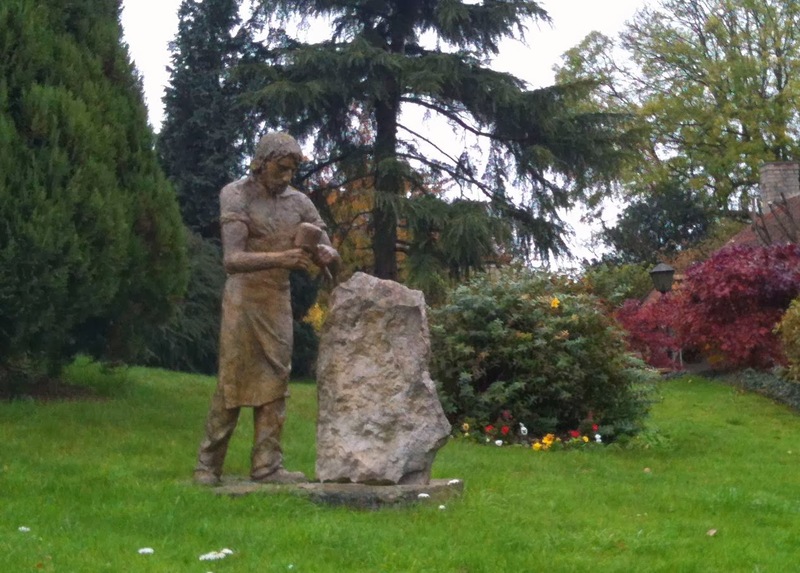 This sculpture of a sculptor caught my eye in the middle of the village. I got back to the car well after dark, and scooted for home. 73 caches, no DNFs. A pair of ex-German army mittens arrived, size 10 (very large) I wanted the very large because I'm planning to wear my fingerless biking gloves, and then when it gets really cold, the mittens over that. So my hands won't freeze when I'm walking or biking, and when I take the mittens off to do a cache, I still have most of my hands covered by the biking gloves. 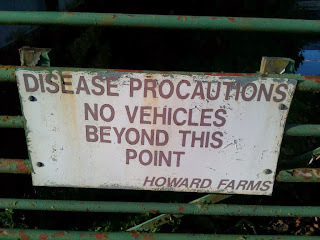 A couple of disclaimers first. Firstly - I do kind-of have a dog in this race; the McAfee antivirus still uses the engine that I designed and implemented. But I'm sure that it's had major additions since I let go of it about 20 years ago! Secondly - what do I use? Well, I use Linux, and I don't run an antivirus. And now a definition. I do actually know the definition of "virus", and it's become irrelevant. I well remember at a conference once, a user speaking from the floor said "I don't care whether you call it virus, trojan, malware or whatever, I don't want it on my systems." Today, the main threat in this area comes from trojans, delievered by email or by someone accessing a web site. My guess is that viruses are now well below 1% of all malicious software that's in the wild. So the problem has changed. The key fact about a virus is that it self-replicates, and once you have a specimen of it, and you've analysed it, you know exactly what it does and what byte-sequences can identify it. Even the most difficult polymorphic (they change their byte-stream in each virus instance) could be reliably detected, using an emulator. But that's not the case with a trojan. If you send out ten million spam emails bearing a trojan, you can make each instance of that trojan different, so that it isn't possible to detect them all with a single byte sequence. And because the virus researcher doesn't have access to the generator of these files, he can't predict the limits of variability. This is called "server side polymorphism". And it's made the field a lot more difficult. Imagine such an email generator, spewing out ten million emails containing the trojan, each one very different from all the others. Suddenly, the AV industry has 10 million things to detect. How long will it take to catch up? And how many false alarms will there be when they send out the detector to their customers. The other game changer has been the internet. 20 years ago, the internet was not an issue. Viruses spread via floppy-sharing and file-sharing. I used to reckon that between the time that I saw a virus, and the time that an ordinary customer would see it, might be a year. Now? It's the other way round. The trojan creator sends out his ten million emails,, the AV company sees it shortly after that. So there's been an increasing dependence on heuristics. That means, not using a byte-sequence to detect something nasty, but instead, analysing the things that the file does (read files, write files, for example) and deciding whether that is likely to be malicious. So - a program reads a file, and replaces it with that same file, only encrypted with a strong encryption system. Is that malicious? It is if it's Cryptolocker, it isn't if its one of a zillion good encryption systems. To decide whether it's malicious, you have to understand what it does (which is difficult enough) and compare it with what the user expected it to do (and computers can't read minds). I've had a look around at various studies on the effectiveness of antivirus. I'm not going to name names, because none of them come up smelling of roses. I avoided looking at reports by companies that have a product to sell, or who are under common ownership with companies selling an AV. And yes, I know very well the difficulty of testing antivirus products, having been on the wrong end of some very mis-designed tests. Imperva say that it takes from 1 1/2 to 4 weeks for an AV to catch up with a new virus. And then there's false alarms. AV Comparatives shows all the vendors giving false alarms, some less than others. A false alarm can lead to all sorts of problems. It's a sad situation. The defences against modern-day malware have large holes. That's not to say you shouldn't use some defence; every problem blocked is one less problem to sort out. But one study I read thought that there was a big overspend on AV, at the expense of other security defences, and they thought that this might be down to "compliance". Or, in other words, some companies spend too much on AV because there's a box they have to tick. Some people opine that user education should help. I think it would if that were possible. I don't think it's possible. I don't think users are interested in this stuff, and think that it's the responsibility of the IT people. If you drive on any motorway and see all the people driving far too close to the car in front, you see how seriously people take security, even when it's their personal well-being that's at stake. I don't have an answer. Fortunately, it's not really my problem. I'll continue to use Linux, and hope that the bad guys don't take aim at it. My guess is that the main problems will continue to be on various levels of Windows, and that in the future, mobile phones will become an issue. We started late; we didn't get out of the house until just after noon. First, we stopped at Beaconsfield Services for lunch; I had a curry at Chosan Noodle, yummy! Ladysolly had a Domino Pizza. I don't understand why people put up with rubbish food from Gordon Ramsey and his ilk, when there's treats like this around. So then we went on to Bernwood Forest. There's 14 caches there, and no obvious route to follow, so I just used the map to plan it. Some of the tracks we followed were so muddy we were sinking in up to our ankles, and to get one of the caches we had to go far from any track into the wild. But we found them all, picked up another one on the way home, and it was a good day out. I got attacked by a dog. Twice. The first one just hurled himself at me and jumped up at me. The owner called the dog (who, of course, ignored the owner). I got my walking pole ready to defend myself if he wanted to get nasty, but I think my determined look made him slink off. The owner said "Sorry about that" cheerfully. I guess she's used to it. The second one was an hour or so later. This one decided that he'd show his teeth at me and bark, trying to intimidate me. Again, I just stood my ground, holding my walking pole firmly in both hands, so that if the dog were to follow up its barked threats with its teeth, I'd be able to give a good account of myself. The owner noticed that I was ready and willing to defend myself, and made strenuous efforts to get the dog under control, which the dog, of course, ignored. Eventually, the dog decided that I wouldn't be easy meat, and slunk away. I was not entirely surprised when the owner rewarded the dog with a doggie treat. She maybe thought that she was rewarding the dog for eventually leaving me alone. I'd guess that the dog thought it was being rewarded for its aggression towards me. I fully agree with the Princess Royal; it's time we started thinking of dogs as a potential source of food. Out today to do this circuit of nearly 50 caches, plus a few more. I went round on the bike, using the newly-adapted battery 7, which lasted 16.5 kilometers, about 6 1/4 amp-hours that got me through nearly 60 caches, which I think is a record for me. I got back to the car at about 4pm for lunch, and by the time I'd eaten and had coffee, it was dark. So then I went to get Lyrical Conundrum (to the right location this time); I'd miscalculated before and was one minute south of where I should have been. And that's a long distance! Then I finished off the day with three caches just off the main road on the way home. 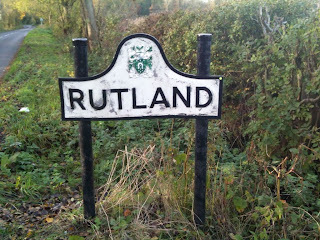 I saw this just as I was leaving Rutland. I had lots of great views of thisinstallation. As the happy recipient of a Late Pass, I planned to do a route of 50-odd caches, followed by an attempt on the Lyrical Conundrum bonus, and a night cache. I got the bike out, and took two of my old batteries, and one of the new ones. In practice, I covered the whole route of 54 caches with just one battery! I got back to the car at about 3:30, had lunch, and went to pick up the Lyrical Conundrum bonus, which I sadly couldn't find. But the night cache went well, although the markers were a bit far apart, and I had to cast about a bit a few times. I covered more than two miles on foot (I should have taken the bike). I managed to drop battery 7 and it cracked open, but I think I'll be able to fix it with sticky tape. Back home, I visited the Tandoori in Chalfont station for the first time. I'll be going there again! I'm planning a day out (with late pass) near Collyweston, Cambs. There's a ring of 50-odd caches to do, and I'm hoping to (at last) pick up the final of Lyrical Conundrum with a short diversion. And then there's two night caches to finish the day. I'll be taking bike.2, newly repaired and with the electronics inside a zipped pouch, which I'm hoping will help keep the wet out. I'm planning to carry batteries 6 and 7, with two of the new batteries as reserves. Plus head torches in case it gets dark while I'm doing this big ring. I'm thinking that the whole route will take 6 hours, which will get me back to the car at 5pm, then another hour for Lyrical Conundru, then the two night caches. Bike.1 was the one that got a motor transplant from China. The motor worked, and the associated controller electronics, but when I gave it full throttle, the battery kept switching itself off. So I went back to the Chinese supplier to get a battery. The first one I ordered simply didn't arrive, I don't know why. The second one, they were unable to send. I think it has to do with regulations covering Lipo batteries on passenger aircraft. Anyway, they gave me a refund for both, and apologised for wasting my time. Fortunately, bike.2 was working fine all this time, so I wasn't seriously inconvenienced. That was what set me off on a battery hunt that eventually led me to Hobbyking; the Hobbyking batteries I bought were 20C, which meant that they would be able to supply 100 amps, and all I wanted was 20 at most. I bought four, because I didn't want to buy a full set until I knew that my plan would work - after all, what I'm doing here is taking stuff intended for model aircraft and suchlike, and using it for my bike. It did work, but buying the other eight batteries turned into a nightmare. They sent the wrong order, I sent it back, they're out of stock, and that saga continues. But yesterday I had a thought. Suppose I run two of my old batteries in parallel; then each of them is only supplying 10 amps, which it's happy with, but the motor gets 20. So today, I wired up a parallel driver cable; two male kettle plugs connected to a female, with a 25 amp fuse wired in for extra safety. And today was testing day. First I tested bike.2, with its new controller. That worked fine, so I put it in the car for use in the near future. Then I tested bike.1, with the new motor from China, and the two old batteries in parallel. I got it out into the road, and gave it full throttle. Before, when I did that, the battery cut out. But now, the two batteries, working in parallel, were happy with the current load, and it all worked fine! So now Hobbyking have put my order back in their pipeline, and as soon as suitable batteries arrive in the UK, they'll deliver. I claimed my State Pension from HMG, and it came through yesterday. It's a lot more than I expected - it's nearly ten times as much as I got paid the first year I worked, in 1968. Almost enough for one of my daughters to have a night out. Ladysolly also gets a pension; between us, I think we probably get enough to live on, provided we didn't need to pay a mortgage, didn't run a car and didn't heat our home. Fortunately, we don't have a mortgage, I have a bike and our love keeps us warm. It was the bike controller, I guessed it would be. I took the old controller out, and removed the end of the box; a small amount of water trickled out. Not good. I've left it to dry out, maybe it will recover. Meanwhile, I installed a new bike controller, bought from electric-hybrid-bikes.com some months ago against just this contingency. I had to rewire the throttle so that the wires matched, and I had to over-ride the lock connector so that it thought that the bike is permanently unlocked. Then I lifted up the front wheel, applied a bit of throttle, and it worked! I've tried to make things a bit more waterproof, by putting the controller and the wiring into a zipped pouch that looks like it should ward off the worst of the water. I think the problem happens when I pressure-wash the bike. That pressure-washer is really high pressure. So I've ordered two more bike controllers (from China), because electric-hybrid-bikes.com were out of stock for 24 volt controllers. I don't need it in a hurry, that's the whole point of having a spare lying around. I also ordered a controller tester. They're only £9, and it sounds like just the sort of thing I'd like to have. So now bike.2 is operational again. Bike.1 is the other Haro DX; it works, but I need more batteries to use it in the field, and I'm still trying to extract my order from Hobbyking. But bike.3 is also operational, that's the Everest folder that I converted a few months ago using the extra motor that I got from AlienOcean and a controller from electric-hybrid-bikes.com. All these bikes are 24 volts, so I have interchangable batteries. My experience with Hobbyking batteries has given me an idea. I could run two of my old 24v 10AH packs in parallel, and I can do that simply by making up a lead that makes that happen, cost near-zero. If my idea works, then that would make bike.1 operational even before Hobbyking sort themselves out. 3) They get new stock of the batteries that I want (date unknown). Daisy offered to send them from Hong Kong, but I said no, because A) it would take a week or more, and B) I'll have to pay import duty, and VAT, and a fee for someone to do that. I'm thinking this is all going to take a few weeks. It's just as well that I'm not in a hurry for this ... but don't tell Hobbyking that! But first, 22 caches around Stoke Bruerne. I did these on foot, because the route was mostly footpaths. And I'm glad I did; the track was very soft and squishy, and there were some terrible kissing gates for getting a bike through. I found all the caches. Then on to Salcey Forest. I had lunch in the free car park, then got the bike out and got ready for a tour. But then disaster struck. The bike didn't repond to the throttle. I tried various things, but nothing worked. I got a bit of a tremble on the front wheel, but nothing useful. 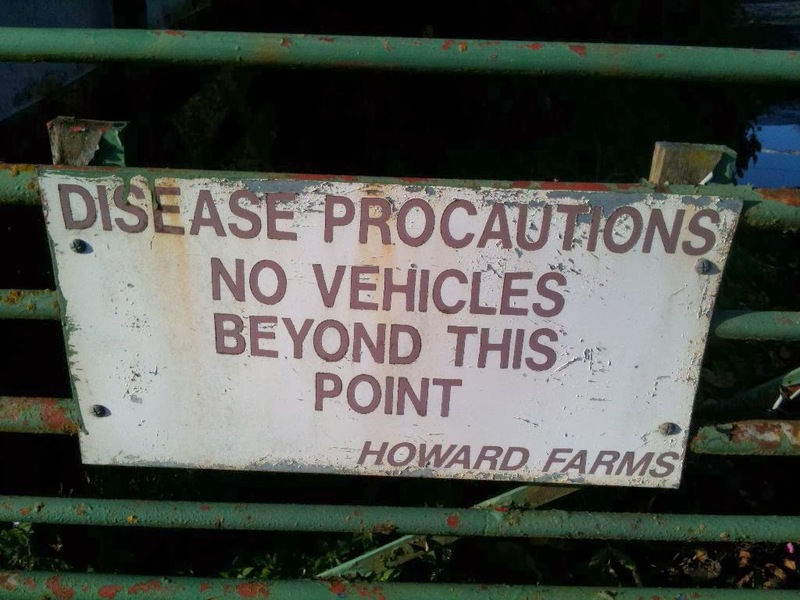 I'll have to investigate this, but meanwhile, I had a decision to make. Abort, cycle or go on foot? I decided to cycle. When the motor doesn't work, an electric bike is still a bike. I went round all the caches that I hadn't done last time I was here, including a very fine night cache, where I followed the markers right up to the motorway and back. And then I revisited a DNF that I'd had last visit. Someone else had found the cache, and given some details on where it was, so I had another go. The details didn't help, and I was just about to give up; I'd picked up the bike for getting back to the car, when I spotted something that looked like it might be the cache. And it was! Hurrah!!! I also made more progress on the Salcey Trail. I now have nine out of the ten numbers. But one of them is firmly stuck inside a post, and unretreivable, and another one is, I think, missing. So I have ten widely separated possibilities. 46 caches done today, and I have to investigate why the bike isn't working. It's either water in the motor, or (more likely) the controller has given up. Today, ladysolly finally gave in to her iPhone craving, and asked for a model 5S, which I ordered for her from the Apple store, because it looks to me like you can't really get it cheaper anywhere else. The cost is huge, but she's worth it, and it'll be her Christmas present. She's getting the gold one, with 64gb of memory because I couldn't face trying to explain to her that 16gb is enough unless you're planning to store lots of video on it, which she isn't. And that means I get to inherit her iPhone 4. This will be an upgrade from the iPhone 3 that I inherited, and it's a very significant upgrade for me. The reason is, you can't use an iPhone 3 for caching, because it takes a *very* long time to notice that you've moved. So casting about to find a cache means: move, wait two minutes, move, wait two minutes ... and so on. And I've googled extensively, and I can't find any way to fix this. The iPhone 4, however, doesn't suffer from this problem, and I've got Memory Map and Geosphere on it. Tomorrow I go back to Salcey Forest to finish what I started there last week. The insect bites that I got in Worthing have pretty much subsided now, so I'm ready to be bitten again! They sent me the wrong order. I sent it back, as per their request. Today, I got a request from them to fill in an RMA so that I could send back the elements of the order that I wanted to send back. But I can't. A) what I received included none of what I ordered, and B) I already sent it back, via a tracked service, and it was signed for by them. So I went on to their Live Chat again, and a nice person who went by the name "Mary" sorted it out, I think. I don't need to do the RMA. They'll find the stuff I actually ordered, which (I guess) is lying around somewhere in their warehouse wondering when it'll be sent, and send it to me. Failing that, they'll have new stock in the warehouse within a day or two, and send me that. All in all, Mary says they'll send out my order within 72 hours. I have, of course, recorded the chat transcript (and I'm sure they do too). Last week, I bought a Haro DX folding bike via Ebay. I paid £56 for it, and I thought that was good. The seller had two of them, and he's just sold the second one. He got £120 for it! That's quite a surprising difference. On or about the 26 October, I got bitten. Several bites by some sort of insect, mostly on my legs. They weren't too bad at first, but gradually got worse and worse until I was finding it impossible to sleep for the itching. Yesterday, I took serious action. I got medical help. Not from my doctor, of course, who is so busy that it's difficult to get an appointment within a month unless you claim it's an emergency. And not from my usual Small Injuries Unit. No - this time, I got my medical help from Tesco. My local Big Tesco has a pharmacy, and they're open all hours, just like Tesco is. So on Sunday, I went there. I showed the horrible-looking blotchy areas to the pharmacist there, who was suitably sympathetic, and prescribed Piriton anti-allergy tablets and Anthisan cream, £6.70. She said they'd make me drowsy, but I wasn't doing anything more taxing that going on a train and attending our Ruby wedding party. And you can drink alcohol with them, but it makes you drowsier. Recklessly, I had three glasses of champagne and a double helping of cheesecake. I took the tablets and smoothed on the cream. Last night I got a really good night's sleep for the first time in a few days, waking at about 2pm. And the bites are feeling much, much better. Medical help is available in the UK, you just need to know where to look. Today, we all piled into daughter.2's for out Ruby wedding anniversary party. We were met by nibbles and a rolling display of out wedding pictures, including the Three Witches, sister.1, dog.1, cat.1 and Morris Minor Van.1. And, of course, a very young ladysolly. And starring the very impressive (but no longer with us because it's the wrong colour these days) moustache.1. Close relatives were there; about 15 of us. Daughter.1 did the catering, which had a red-and-pink theme, including salmon, smoked salmon, gefilte fish and goujons. But the pinnacle of the meal was the raspberry-topped cheesecake, which was really excellent. I was pretty much out of it - I'd taken Piriton for a very itchy set of insect bites. Piriton makes you drowsy, three glasses of pink champagne makes it worse, and I didn't get much sleep last night because of the irritation. But I wasn't driving, we let the train take the strain. Ladysolly wanted to be able to print from her iPad, a reasonable enough request. I have a couple of inkjet HP Deskjet 3050A printers, but they're very heavy on ink usage, and need a new cartridge every week or so. So, I thought, laser printer. Airprint compatible, because Airprint is the way that iPads and iPhones print. I went to Ebay, and found a Dell B1260dn, brand new, £80. I ordered it, and it arrived the next day, pretty fast! And then the nightmare started. I thought, in my dreams, that I'd just switch it on, it would find the nearest wifi point in the house, use DHCP to get itself an IP address, and after a half a minute, I'd be able to print from an iPad. No way. I'm not going to tell you all the things I tried, I probably won't remember most of them. But what it came down to, was that I was expecting the printer to use wifi to connect (like the HP inkjets do), and it doesn't have wifi. To be fair, it didn't say that it had wifi, it said that it could do Airprint. But to me, Airprint implies wifi, and I was wrong about that. I have to explain a bit about my network here. It's quite complicated. The main network uses IP addresses that start with 10; anyone can use those, they aren't visible from the internet. To make them visible where I want them to be, I use my firewall to do NAT (Network Address Translation) to translate the 10. addresses, to addresses that are routed to my router. But also ... as well as my main router, I have three DSL routers, which give me cheap, but not entirely reliable, bandwidth. They are also on the 10. network. And I have a wifi router, so that wifi devices can connect. But the wifi also uses NAT, using addresses that start with 192.168 (also invisible from the internet), and it translates those to 10. addresses, which are then routed via one of the DSL routers. The iPads and iPhones use wifi, so they get their addresses from the DHCP on the wifi routers, and they start with 192.168. (which the wifi routers translate to 10.something, and then my main router translates to a real internet address) (but only for those things that I want to allow access to from the outside world). Security, you see - I don't want some kid in Russia using my computers. So I connected the Dell printer to a Windows machine via USB, and ran the setup, which installed drivers on the Windows machine. 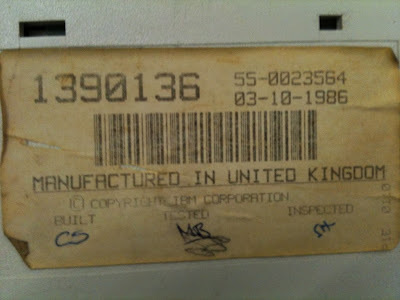 But the IP address that the printer had was 169.254.86.108. I have no idea where it got that from. So I changed my Windows machine so that I could access it, and changed it from DHCP to a static address, 192.168.1.129. Then I changed the Windows machine to an address in the same subnet, and I was able to talk to the Dell printer from the Windows box. I tried a lot of different things. But what it boiled down to, was I was assuming that the Dell had Wifi, when it didn't. Because it didn't, I had to connect it to the wifi router so that it could use the 192.168 address, which is the same subnet that the iPads and iPhones use. The Dell manual was useless to me. Nowhere did it say "THERE'S NO WIFI". And I was gradually coming to the conclusion that, on this Dell printer, the Wifi wasn't working. I needed ladysolly to clue me up; she found a page using Google that said "THERE'S NO WIFI". No wonder it wasn't working! Once I took that on board, it was pretty obvious what I had to do, and I did it, and now it works. Upstairs. Because downstairs is a different wifi router, and the iPads can't see the printer. Ladysolly says that's OK, she's usually upstairs when she wants to print, plus she has the HP Deskjet 3050A downstairs. Ladysolly has a problem with email on her iPhone. It works OK on the iPads, and on a computer, but the iPhone keeps asking for a Exchange password, and won't accept the correct one. She says it's not a big deal, as long as it works on her iPads, but I detected the note of terror in her voice when I suggested deleting the iPhone access and reinstalling it. Evidently, there's a lot of important stuff in her email account. Which means that she's using it as an important database. And she doesn't have any sort of backup. The fact that she can access it via several different routes, doesn't mean that there's more than one copy of this data. There's only one copy, and it's on a server owned by Google. I've alsways felt that saying that you "keep something in the Cloud" actually means you "keep something on someone else's computer". And that's not safe to start with. Suppose Google decide to delete the account, because, well, any reason they fancy. It's free, so how could you complain. And I'd guess that if you actually read the Terms and Conditions, they don't make many promises about the integrity or availability of your data. I'm guessing that loads of people are in this situation, and when they do lose all their data, all they can do is ... suffer. I've seen the suffering when someone loses all their data, and it's horrible. 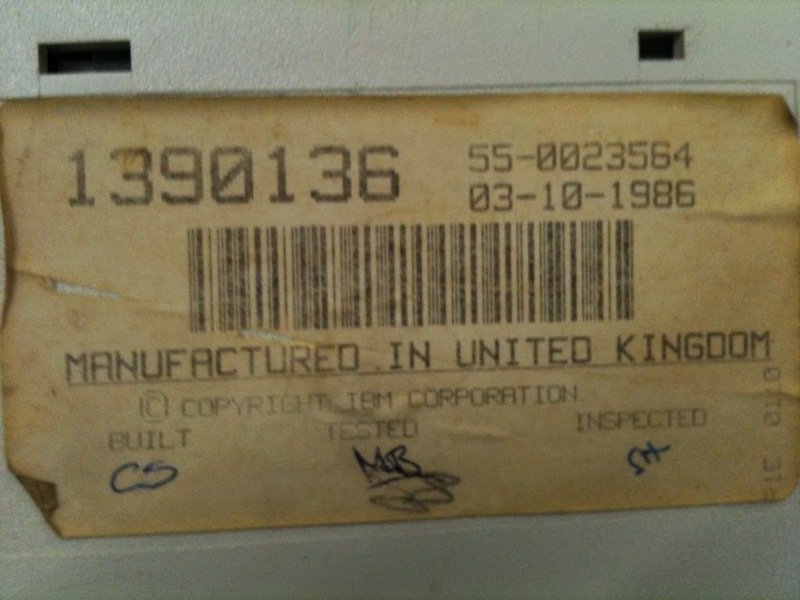 I used to run a Data Recovery service (no fix, no fee) and we were only successful 95% of the time. So how do you back up a Google email account? Pop and fetchmail, is how. First you need to enable Pop on google mail. Log into your Google mail account on Google, click on the thing that's supposed to look like a gearwheel (top right) and choose "settings". Then click on "Forwarding and POP/IMAP" and click on the radio button that enables POP. And tell it to "keep Gmail's copy in the inbox". Click on "Save changes" and you're done here. the -k means "don't delete the emails you access (although Google wouldn't allow that anyway, the way I set it up). 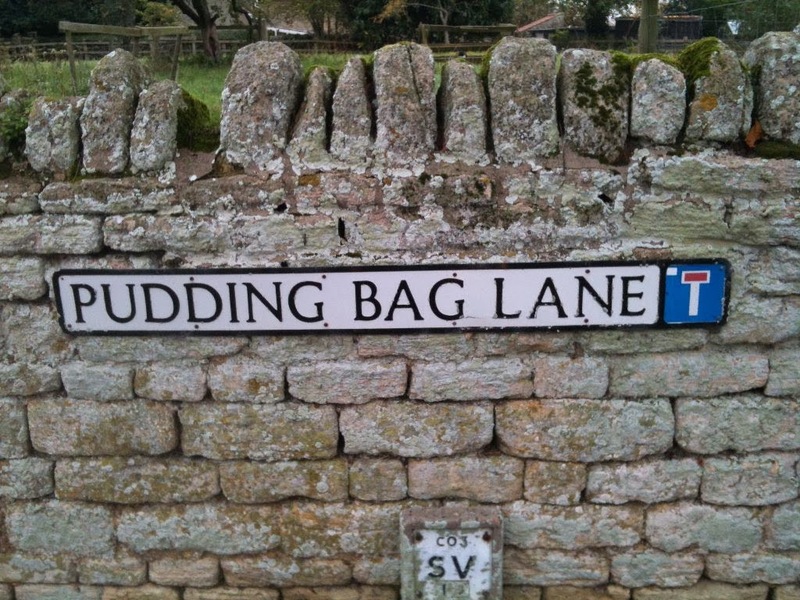 This, of course, is cockney rhyming slang; it's the first word in "cobblers awls". I don't have an awl, but I do have a boot which has lost one of its lace-holders. I think it's a common problem with the Hi-tec Eurotrek, because I've heard of two other people who have had the same problem. Possibly, if I sent it back to Amazon they'd replace it, but the boot is a some months old now, so maybe not. It's the left boot, and it's the top lace-holder on the left. I think that's probably the weak one; maybe it takes more stress. The first problem happened when it bent and was no longer holding the lace. I fixed that in the field with a pair of pliers. But then it happened again while I was in Salcey Forest. I did a work-around of using the second highest lace-holder twice, but that's not really ideal. I like these boots. THey're comfortable, and they're actually waterproof (as distinct from some waterproof boots which aren't). So I'd like to keep using it. Today I had a look, and I did a more permanent repair; I didn't use an awl, I used a small drill. 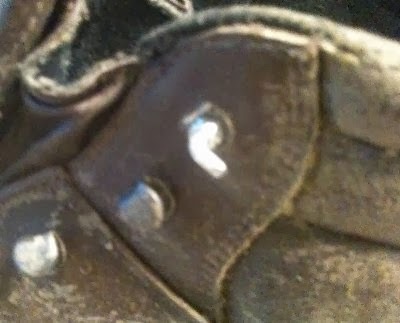 You can see the two lower lace-holders, and then above them, you can see the small bolt that I put in; a washer on the inside, and a self-locking nut on the outside. Then I bent the bolt so that it would retain the lace - I started the bend with pliers, but finished it off with a hammer, using a bench vice as the last. I feel confident that this will work, and none of the other lace-holders have shown signs of weakness. And I've ordered another pair of the same boots from Amazon, for £45. A good pair of boots in Foxes would be more than double that amount.